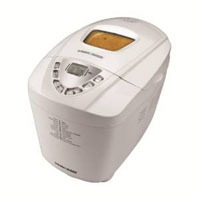 If you’re just starting out with making homemade bread, then you’ll appreciate this automatic breadmaker from Black & Decker that does most of the hard work for you. The tools for the Black & Decker B6000C include a kneading paddle, a nonstick pan, and a measuring cup and spoon. We were happy to observe that the machine works quietly and produces big, fluffy horizontal loaves up to three pounds. We also noted that the machine produces soft, flavorful bread with a light crust and also has the capability to make thick breads if desired. The Black & Decker B6000C is available for $85.07.